Jay Armstrong Johnson, Tony Yazbeck, and Clyde Alves. Photo by Sara Krulwich. BOTTOM LINE: Though On The Town brings some splendid choreography and performances, this revival does not dance its way into our our hearts. The revival of Leonard Bernstein, Betty Comden, and Adolph Green’s musical On The Town is rife with gags, hijinks, and broad comedy. Jackie Hoffman, who has made a career for herself as a scene stealing and scenery chewing comedienne, has several marvelous turns in her multiple-character track. But when one of her characters becomes trapped in front of the computerized proscenium arch unable to make heads or tails of this new fangled thing that lights up and changes colors, it’s all too clear that this production’s overuse of technology confuses the tone of a musical that is meant to be a nostalgic love letter to 1940s New York City. It is no secret that the theatre has gone projection-happy over the past few years, and it seems logical to rely on projections when the decision was made to transfer John Rando’s production (which originated at Barrington Stage Company’s 520 seat theatre) and expand it for the 1,932 seats of the Lyric Theatre on 42nd Street (formerly the Foxwoods Theatre). Regrettably the scenic and projection design (by Beowulf Boritt, the well-deserved Tony winner for Act One last year) is an eyesore that somehow manages to make the production look cartoonish and cold at the same time. It must be a herculean task to move a regional theatre production to the cavernous Broadway house that is used to holding major spectacles like Spider-Man: Turn Off The Dark, Young Frankenstein, and Chitty Chitty Bang Bang; but unfortunately On The Town’s creative team never manages to create a beautiful spectacle, and in attempting to do so they cheat this gorgeous musical of some much needed warmth and heart. Now for some plot. Don’t worry, this won’t take long. Three sailors, on leave for 24 hours, attempt to see the sights and lights of NYC, and find a little romance along the way. What makes On The Town’s thread-of-a-plot a helluva show is the lush Bernstein score and the jaw-dropping dancing, not to mention plenty of hilarious Comden & Green scenes and characters (in some cases, caricatures). The production often goes for broad strokes in the humor department, which tend to work in the show’s favor. Director John Rando inserts some contemporized comedic bits that play nicely, and a slew of hilarious dames in the principal and supporting roles thankfully provide a hefty helping of laughs along the way (especially Allison Guinn as the chronically side-splitting Lucy Schmeeler). As the trio of sailors and their love interests, we have Tony Yazbeck as Gabey and Megan Fairchild as Ivy, aka Miss Turnstiles. Mr. Yazbeck is probably the finest singer-dancer on Broadway today, and is one of the few people who performs both skills equally well in his earnest portrayal of the lovelorn Navy boy. Ms. Fairchild, ordinarily a principal with the New York City Ballet, brings down the house during her first dance number and is stunning to watch anytime she points her feet, but...sadly it’s not just a dancing role, if you catch my drift. Clyde Alves and Elizabeth Stanley play the overzealous couple Ozzie and Claire DeLoone who tend to get “Carried Away” in both song and performance; and Jay Armstrong Johnson and Alysha Umphress are the crowd-favorites Chip and Hildy. Umphress is sure to impress with her big voice and don’t-f***-with-New-York attitude, and Mr. Johnson gives one of the most winning performances of the evening as her charming dope. 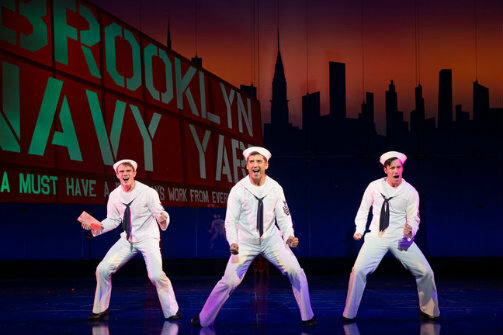 But the real reason to see any production of On The Town is the dancing, and in this regard it will not disappoint. Joshua Bergasse has an impressive resume (his choreography was perhaps the one saving grace of the series Smash, and the guy even won an Emmy for it), but until now his dances have never waltzed across Broadway. Bergasse’s choreography bursts on to the stage and infects this production with vitality. There are plenty of respectful homages to the iconic work of Jerome Robbins, but Bergasse also puts his own stamp on the material, and creates without doubt the most thrilling spectacle of the show. Though there are some overreaching moments (including cavemen boogying with a T-Rex, and a pas de deux between Gabey and Ivy in a boxing ring) the movement that fills them is mesmerizing to watch when performed by the principals and the gifted ensemble. There are many wonderful elements that make this revival a well-spent evening, but ultimately it comes up short. If On The Town were not saddled with such an impossible theatre to occupy, the production might not have needed the steroidal treatment it’s getting. New York, New York may be a helluva town, but rarely does this production capture the magic, the peculiarities, and the personality that make this city a thrilling getaway to some, and home to the rest of us.